On my previous post, I have been made a review about the Skinmiso Pore Beauty Nose Pack (3 Steps) 10 Weeks Program. Nowadays, my big concern is about enlarged pores since I have a combination skin type but it will change depends on the weather too. Then, I hear about the brand of Skinmiso; this brand makes the focus on pore on their main skin care line. I would like to try the best product of Skinmiso, which is the Skinmiso Pore Corset Serum (30ml). I bought this product thru the Hermo website with the price after discount is RM 118.00 and the normal price is RM 139.62. The Skinmiso Pore Corset Serum is the best pore tightening serum. 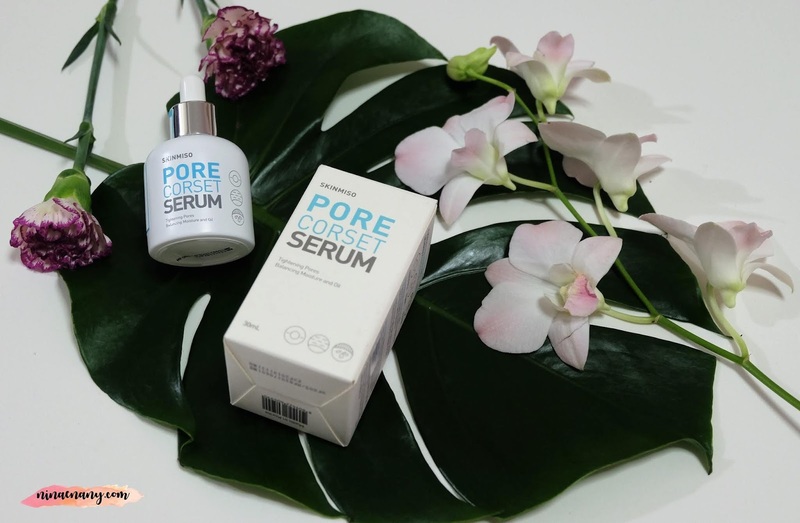 Thus pore tightening serum is perfect for people who have enlarged pores or people with excess sebum and oily looking skin. This pore tightening serum is unlike any other serum. Clinical studies pore shrunk 34% in size after using the Pore Corset Serum. The main features of the Skinmiso Pore Corset Serum have been the focus on three factors to help to tighten pores and also make the skin flawless. The first feature is 20 minutes of thorough pore tightening therapy. The enlarged pores due to multiple factors break down the hydration barrier and lower the elasticity of the skin. The Skinmiso Pore Corset Serum tightens the pores immediately to restore firmness and youth to exhausted skin. The second feature is the optimal hydration balance to regulate sebum. The long-term usage of the Skinmiso Pore Corset Serum in the transformation of pores and regulating serum, the cause of oiliness and skin troubles with a hydrating but light finish. The Pore Corset Serum creates the optimal hydration balance for the skin to regulate the excess production of the sebum to prevent pore enlargement. The last feature is revolutionizing skin tone and texture. The Pore Corset Serum protects frequently irritated and abused pores from damage and enlargement to revolutionize rough, uneven skin tone and texture into smooth and flawless skin. It's easy to use the Skinmiso Pore Corset Serum. Just apply to areas of the face with enlarged pores, and then gently tap with fingertips for maximum absorption. Cleanse your face thoroughly using Rise Form Cleansing to completely empty out pores. Using the Skinmiso's Pore Beauty Nose pack on areas of the face where there is left over sebum. Apply Spot Repairing Serum to red, irritated, irritated spots and acne scars. Apply Pore Corset Serum to the area on the face with enlarged pores. Please wait at least 20 minutes after applying Pore Corset Serum for maximum results. As your notice, it's required to wait at least 20 minutes after apply the Skinmiso Pore Corset Serum. So I make the decision to use it on my night routine only when weekdays. I don't have time in the morning during the weekdays. I have to rush to prepare to go to work at 06:30 am. So far, I have been using this product is almost 1 month and I can see the little different on my face. I would like to give the 3.8 stars out of 5 stars to the Skinmiso Pore Corset Serum.